Another year, another CAX. And another awesome weekend like no other. I checked into my room and then went down to the showroom for my volunteer window. Even by 3 PM the showroom looked very filled, so it was clear that Ken, Jim, TJ and Mark had things ready to go. 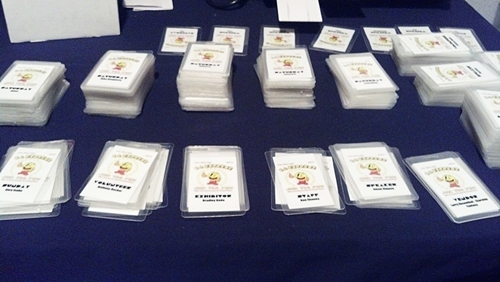 I got the worst job in the world: alphabetizing all the pre-register laminated name tags. My spell checker just had to correct me on ‘alphabetizing’, so yeah. But the next day the show began. Michelle Morris did her usual awesome job coordinating the front end. I put a few games on STERN’s Mustang Pinball, and while the game seemed to get a lukewarm reception on release, it’s a solid player. Of course, no CAX is complete without these two ultra-rare games. I got a video of an incredibly good Dance Game player working both foot pads. 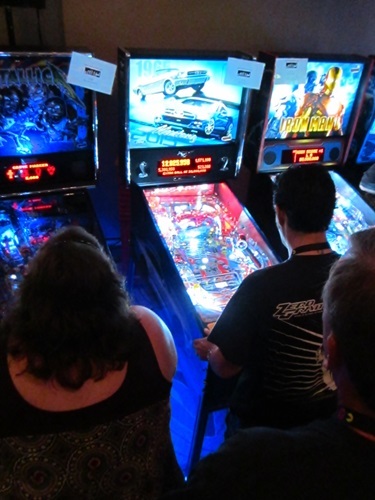 On Sunday, I ran two fun pinball tournaments right next to the Pacific Pinball Museum booth in the main showroom using the Surf Champ clear pinball built by Michael Schiess. 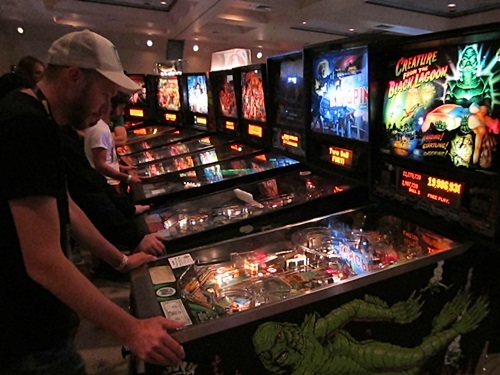 The cabinet and playfield are made of plexi-glass so you can see what the mechanics are doing while the game plays. 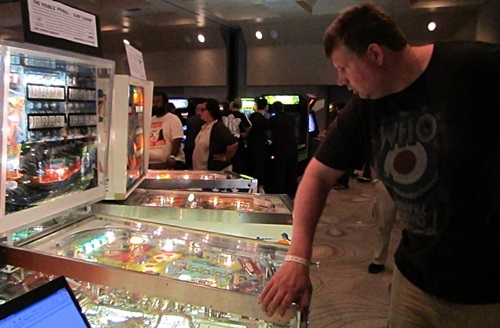 The first was a split-flipper tournament where two players work as a team, one on each flipper. The winners were the final team to play: Jem Gruber and Jeff Fehervari. 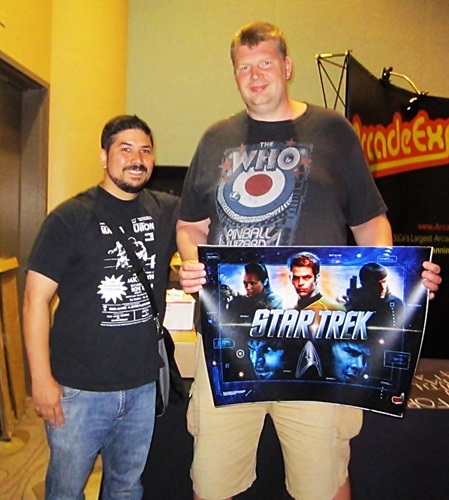 Jem and Jeff each took home a Star Trek translite and t-shirts provided by STERN pinball. Congrats guys! 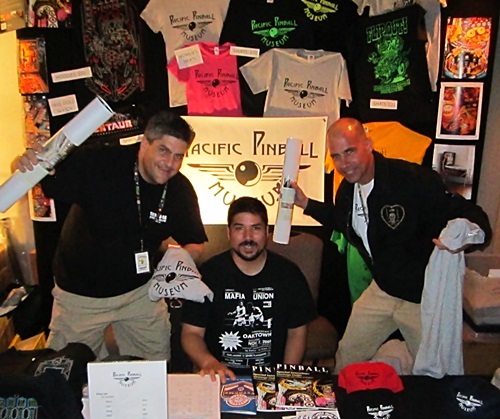 Jeff Fervari and Jem Gruber with their loot. The second tournament was single-player, one-handed affair, which is inevitably hilarious since lots of players will instinctively want to use their non-playing hand when things get tense. Former NBA Basketball player Todd MacCulloch pulled off an amazing game. I’ve talked to Todd on many occasions and he’s such a mellow guy, and sort of a…well “gentle giant”. But once he started his game he visibly transformed. He was crazy fast and his hands and reactions were very quick. Logically it makes sense: that’s what it takes to get to the NBA, but still, seeing it in person is another thing. On ball one he earned an extra ball, something no one else managed to do. Then, on ball two, only 2000 points short of the leader’s score, he tilted! And the tilt carried through to the next ball, costing him two balls! Had he not earned the extra ball on ball one his game would have been over! With his last ball he went on to put another 10k on top for the solid win. Congrats to Todd! The STERN T-shirt was way to small for Todd so he gave it to the runner-up, Dale. Todd is great guy! In the main tournament, (full bracket HERE) Bay Area local Brian O’Neill of SFPD won the Casual Division. Bay Area players have won the Casual Division the last four out of five years. The Bay Area also did a great job in the Classics Division. Alex Samonte of BAPA took 2nd, Andrei Massenkoff of BAPA/SFPD took 3rd and Josh Warren of BAPA/EBPL took 4th. So. After all the dust has settled, obviously this only scratches the surface of this awesome show. I wanted to hit some seminars – I didn’t. I wanted to play in Stephen Kleckner’s Street Fighter Tournament – I didn’t. I wanted to not have something break at work on Saturday – it did. But, I still had an awesome time and I have a reason to go back next year. :-) Not that I needed one. 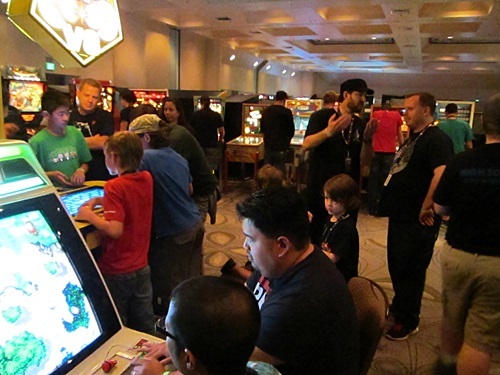 Huge thanks to the team that put on CAX: Jim, TJ, Mark, Michelle, Ken, and all the volunteers do an incredible, stressful job for you. Be sure to thank them when you see them. 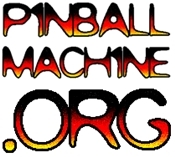 And play more pinball! I suppose if you’re used to not paying then it might seem like a detriment, but I’m not sure the tournament would be what it is without the show, so I have no qualms about supporting it. Not to mention, this year several of the tournament games were pulled from the show floor. Next year, considering volunteering. For each 2-hour window you work you get entry for a day. You can volunteer as early as Thursday (when load-in starts) and as late as Monday (load-out). You can also bring games to get entry, but I don’t know the details. 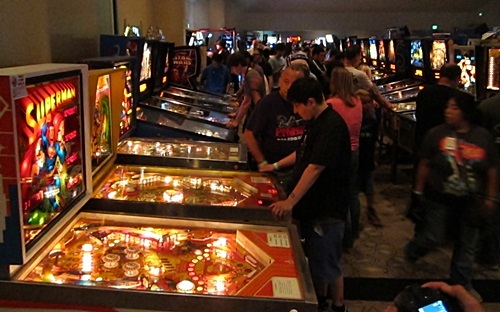 Its “too bad” because in years past if you wanted to just enter the pinball tournament you didn’t have to pay for the show. You just paid to get into the tourney.Dont get me wrong but the show is awesome. But to pay each day to get in and enter the tourney. Thats a lot of $$$$$. Why do you think it’s “too bad” that you had to pay to get in to the event and tournament? The event was awesome. 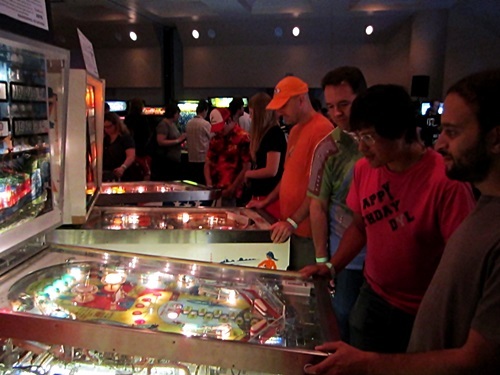 Too bad you had to pay to get into the event and pay to enter the pinball tournament. Pinball tournament area was too compacted. Separate room for the tournament would have been way better (like they used to do in the past). Thanks for a great write up Jon! And cool pics too. Miss it all so much.